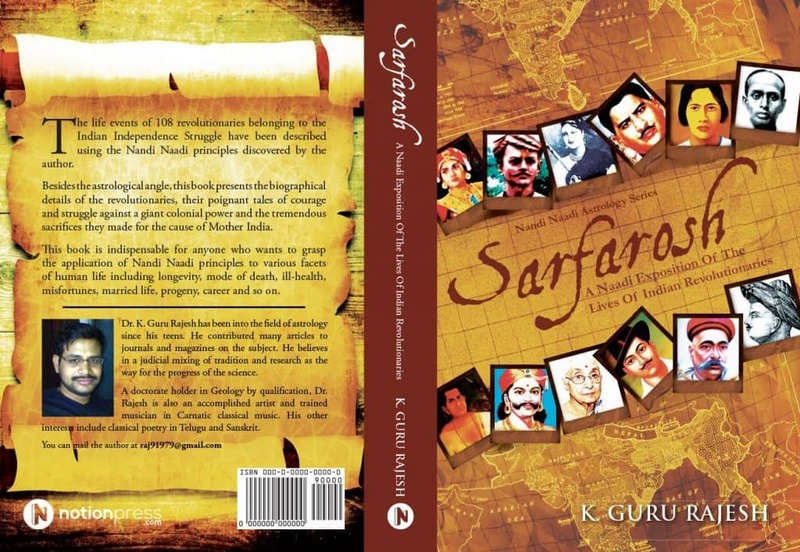 The life events of 108 revolutionaries belonging to the Indian Independence Struggle have been explained in a novel way using the Nandi Naadi principles discovered by the author.Besides the astrological angle, this book presents the biographical details of the revolutionaries, their poignant tales of courage and struggle against a giant colonial power and the tremendous sacrifices they made for the cause of mother India.This book is indispensable for anyone who wants to grasp the application of Nandi Naadi principles to various facets of human life including longevity, mode of death, ill-health, misfortunes, married life, progeny, career and so on. Dr. K. Guru Rajesh has been into the field of astrology since his teens. He contributed many articles on the subject to journals and magazines. He believes in a judicial mixing of tradition and research as the way for the progress of the science. A doctorate holder in Geology by qualification, Dr. Rajesh is also an accomplished artist and trained musician in Carnatic classical music. His other interests include classical poetry in Telugu and Sanskrit. be fixed by studying the transit of planets. This makes possible the analysis of horoscopes of revolutionaries wherein details of birth time are not available. This book has been written with two objectives. The lives of many Indian national leaders, who were mostly from the Indian National Congress, are available as general biographies and with astrological analyses. However, the biographies of revolutionaries and martyrs who sacrificed everything, including their lives, for the sake of the motherland are lost in oblivion. Astrological analysis of their lives is even rarer. The first aim of this book is to impress upon today’s youngsters the selfless sacrifice, patriotism and courage of these revolutionaries and inspire them to develop the noble attributes of patriotism and self-sacrifice. The second aim of this book is to demonstrate the utility of the principles of Nandi Naadi astrology by the analysis of the horoscopes of the revolutionaries. Some of them died young, others lived up to middle age, while some others had a long lease of life. Some died in battlefields, some through weapons, some were hanged to death and some died from natural causes. Some of them lost their parents early in life. A few were adopted. Some had siblings while some others were single children. Some of the revolutionaries married early, while others had late marriages. There were revolutionaries who married more than once. Some married widows while others had love marriages. Some revolutionaries had progeny while some died childless. Some revolutionaries faced severe physical difficulties including incarceration, deportations and debilitating illnesses, while some others were powerful rulers and held politically important positions. Some of them fought without leaving their native places while some others carried out their struggle from foreign lands. Teachers, homemakers, poets, writers, musicians, doctors, lawyers, soldiers, clerks, monks – they were from diverse backgrounds. Hence, I believe that the experience gained by studying the lives of these revolutionaries using the Nandi Naadi method will bestow deep insights that will be of great aid in horoscopic analysis for astrologers. The advocates of the traditional Parasari and Jaimini methods or the followers of modern methods like K.P. may feel that the Nandi Naadi system applied in this book is too simple, unrealistic and useless. However, believe me, the logic behind this method is superlative, sublime, simple and almost infallible in the hands of an adept. My views in support of the Nandi Naadi system should not be considered as my disregard for traditional Vedic astrology. I am a sincere student and researcher of traditional Vedic astrology. Readers of my articles on Vedic astrology published in the erstwhile The Astrological Magazine and its successor Modern Astrology are well aware of this fact. In my humble opinion, the Nandi Naadi method applied with conventional astrological analysis would greatly enhance the predictive capability of astrologers. Keeping this in mind, a separate chapter dealing with the general rules of Nandi Naadi system is included in the beginning of this book to help even novices follow the Naadi astrological discussion given in the biographies. For readers who would like to dwell deep into the application of the Nandi Naadi method to various aspects of human life, I would suggest my other books. To the keen and discerning mind, the astrological explanation provided in this book will give lot of insights into the nuances of Nandi Naadi method. This book contains the biographies and astrological explanations for the life events of 108 revolutionaries who were active from the 18th century, up to 1947 – the year that India won independence. In fact, there are thousands of revolutionaries in the illustrious history of the Indian freedom struggle. However, for many of them, even the birth date is not available. Hence, for this reason, and keeping in view the size of this work, 108 leading revolutionaries have been selected and arranged in a loose chronological order. Care has been taken to gather relevant and correct information regarding various events and dates, but I cannot vouchsafe for their accuracy as I have collected them from various sources. While discussing every biography, a brief introduction of the revolutionary with his/her date and place of birth is provided. This is followed by the analysis of the birth chart in the light of Nandi Naadi principles regarding the potential promise in the Horoscope. Afterwards, the life profile of the revolutionary is discussed in detail from childhood to death along with the planetary transits responsible for the unfolding of these events. All the horoscopic charts are cast for 6a.m. for the required date at Kolkata, my place of residence, while working for this book. The possible alternative position of the Moon in another sign is indicated by placing the Moon within parenthesis – “( )”. In the astrological discussion the planetary combinations are indicated by placing planets separated by hyphenation “-”, such as Sun-Jupiter-Mercury when Sun, Jupiter and Mercury are associated. Whenever reference is made to planets that are involved in mutual sign exchange, they are indicated by a slash “/”. For example, when Mars is placed in a sign of Saturn joined with Moon and involved in sign exchange with Saturn, they are referred to as Mars/Saturn-Moon. I have to express my sincere gratitude to late Sri R.G. Rao, whose book Bhrugu Nandi Naadi forms the basis of my research in Nandi Naadi. Secondly, I am thankful to various websites, including Wikipedia, from where I have collected biographies of the revolutionaries. I am grateful to Sri Satyanarayana Naik, renowned author and one of the senior researchers on Naadi astrology in India, for taking out some valuable time from his busy schedule for writing the foreword for my humble work. I express my love and gratitude to my father Sri Krishna Murthy Rao, mother Radha, wife Prathima and daughter Srimayi for their understanding and care. They stood by me though I could not give the time they deserved as I was immersed in writing this book. If this book could awaken patriotic fervour in readers and impress upon them the utility of Nandi Naadi system, I would consider my efforts fruitful. I am enthused to share the opinions and experiences of astrologers who have applied the principles explained in this book.